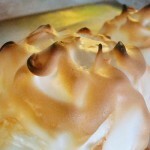 Baked Alaska may be firmly planted in “pinkies-out” dessert territory, but it’s actually a pretty easy dessert to make. Really. 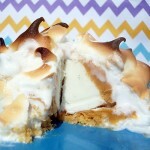 This dessert is a science experiment in delicious action: a chilled ice cream center perched atop a cookie or cake base is completely sealed in by a meringue mixture, which is toasted briefly in a very hot oven. 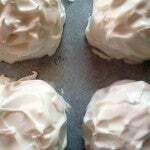 Because the meringue fully coats and insulates the cold mixture, it can be served with a toasty, warm exterior which gives way to a still-chilled interior. To make matters more delectable, this version has a swirl of The Bee’s Knees swirled into the ice cream interior, as well as the cookie base. 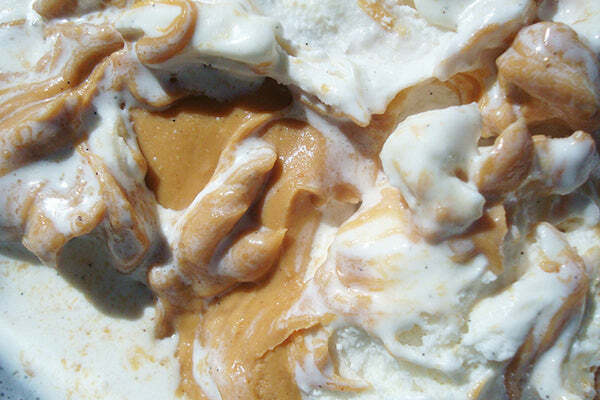 Peanut butter lovers will all scream for this ice cream dessert! Prepare yourself for some serious compliments, because even though it’s easy to prepare (shh! 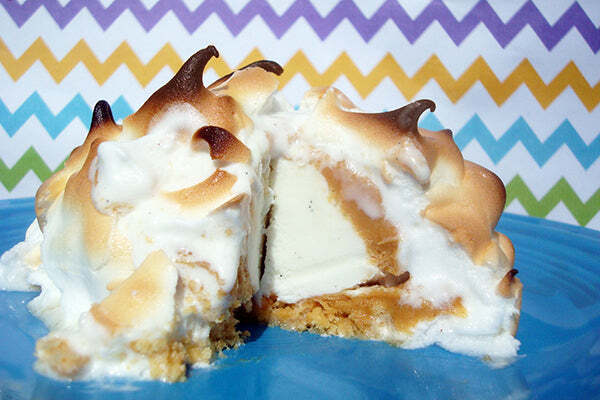 ), this recipe will make you seem like a kitchen wizard to your family and friends. 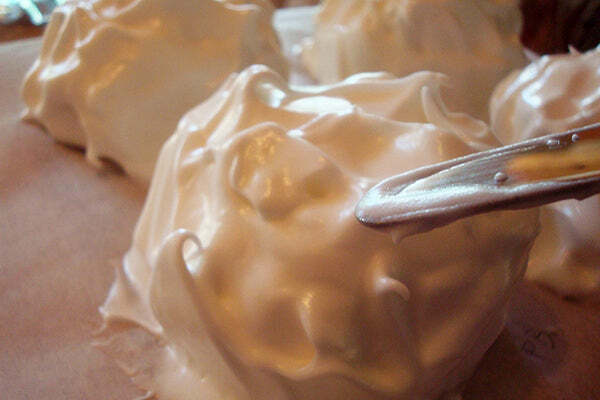 Note: Wetting your knife in hot water in between cuts makes the finished dessert easier to cut. 1. Line a Texas-sized cupcake tin with 6 cupcake liners. Set to the side. 2. 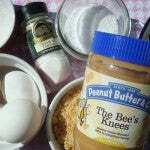 In a large bowl, combine the cookie crumbs with 2 tablespoons of The Bee’s Knees. 3. 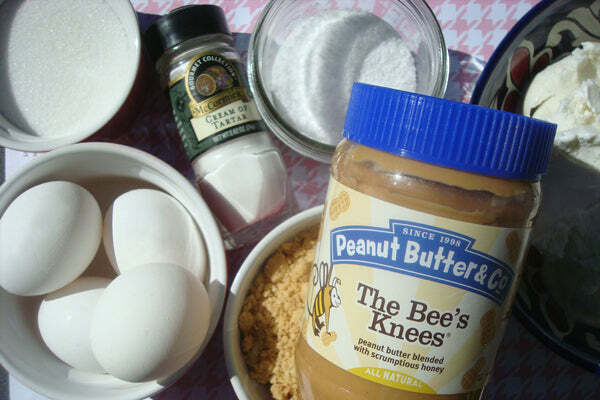 Place the ice cream in a large bowl, and mix with the remaining 1/2 cup peanut butter. 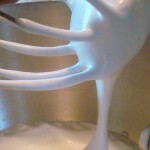 Stir as long as you’d like; less stirring will result in a ribbon throughout the ice cream, more stirring will make it more distributed. It’s your preference. 4. 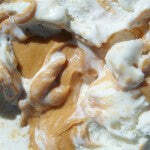 Place the ice cream in the freezer and let it firm for about 30 minutes, or until it holds its shape well when scooped. 5. Place a nice, round scoop of ice cream on top of each of the cookie crumb bases. 6. 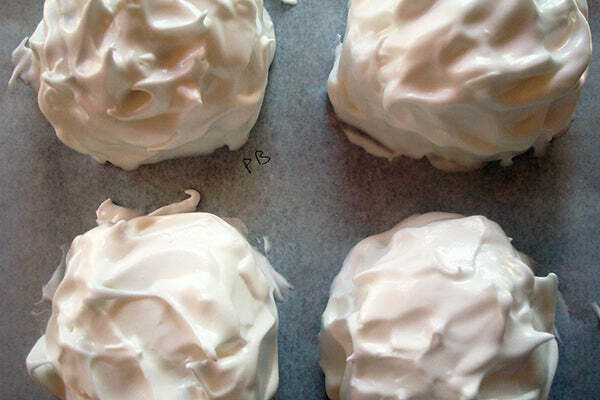 Place the entire tray in the freezer for at least 2 hours or even overnight. You want these babies to be frozen. 7. 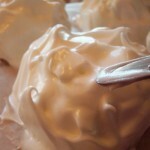 Whip the egg whites and cream of tartar for 2 minutes on medium high speed. 8. 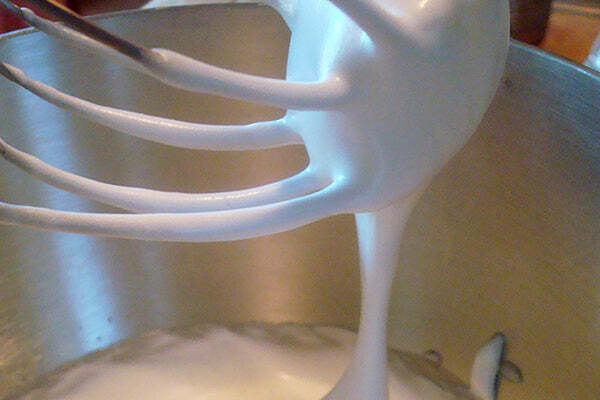 Increase the speed to high and add the sugar in a slow stream until stiff, but not dry peaks form. 9. Remove the ice cream stacks from the freezer and place them on a parchment-lined baking sheet that will fit in your freezer. 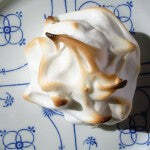 Cover each ice cream dome with the meringue covering completely and make swirly peaks with a spoon all over (think punk rock hairdo). 10. Freeze again, right on the sheet, for 3 hours or overnight. 11. Heat the oven to 500°F. 12. 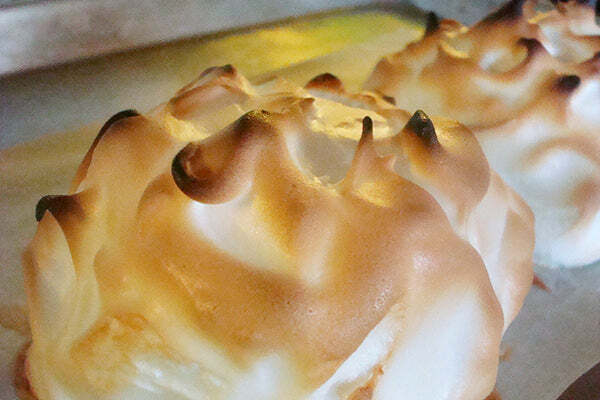 Bake the baked Alaskas for 2-5 minutes, or until the peaks begin to turn golden. Remove from the oven and serve immediately. 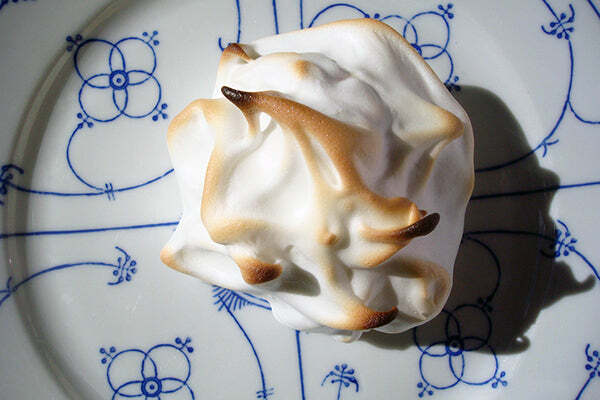 Or you can place it back in the freezer after the meringue bakes until you are ready to serve. 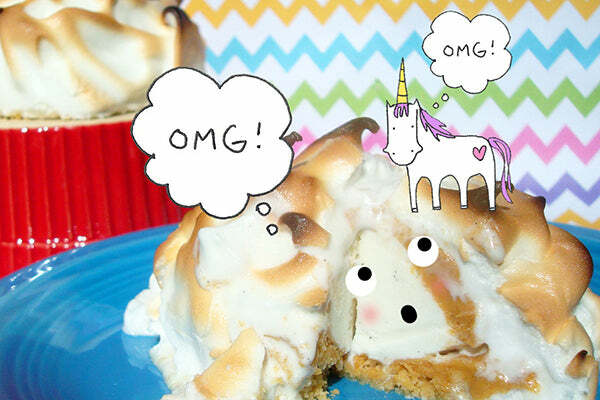 What other unique desserts would you like to see us add peanut butter to? – The giveaway is open to USA residents only and will run until Monday, February 9nd, 2015 at 11:59 PM EST. – Winner(s) will have until 2/16/15 to claim their prize or we will choose another winner. 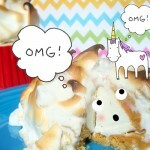 The post Mini Peanut Butter Baked Alaskas appeared first on - Peanut Butter & Co. Recipe Blog.